Bring the pumpkin water and salt to a boil. Stir in the oats. Cook for two minutes. 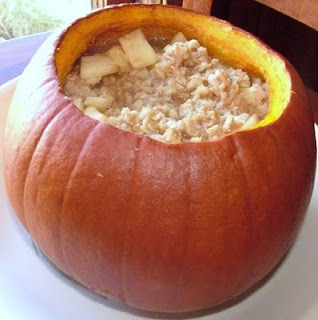 Add the cinnamon, pumpkin, and vanilla sugar and cook until the oatmeal reaches desired consistency. Top oatmeal with pomegranates, walnuts, and a sprinkling of brown sugar.